Apple’s Black Friday sales started going live online earlier today in a number of Apple Stores around the world, including: Australia, New Zealand, Germany, United Kingdom, and more. Now, Apple’s deals for the United States and Canada are live with the expected $100 in savings on MacBooks and smaller savings for iPads, iPods, and select accessories. We obviously had to white out numbers above – From Apple’s Retail inventory system. A source inside Apple Retail has shared with us the numbers for Apple’s Black Friday sales event. Black Friday is always huge shopping day and Apple forecasted at least 4X sales for the day. However, because Apple did have the lowest prices on big ticket items like the iPad, it blew away forecasts by 7PM and unsurprisingly had its biggest sales day of all time..
Apple Retail was forecast and broke Retail sales records all over the country today, this is from [redacted] today, the forecast today is more than 4 times what we normally do. We broke the forecast by 7pm. MacBook Air sales were also particularly strong according to our source. This brochure might look familiar but it is now out in the open. Our leak earlier this week was obviously spot on. Early visitors to the Apple Store noted that there was a lot of traffic but things were orderly and with the help of “EasySteal”, they were in and out in a matter of minutes and saved lots of money. 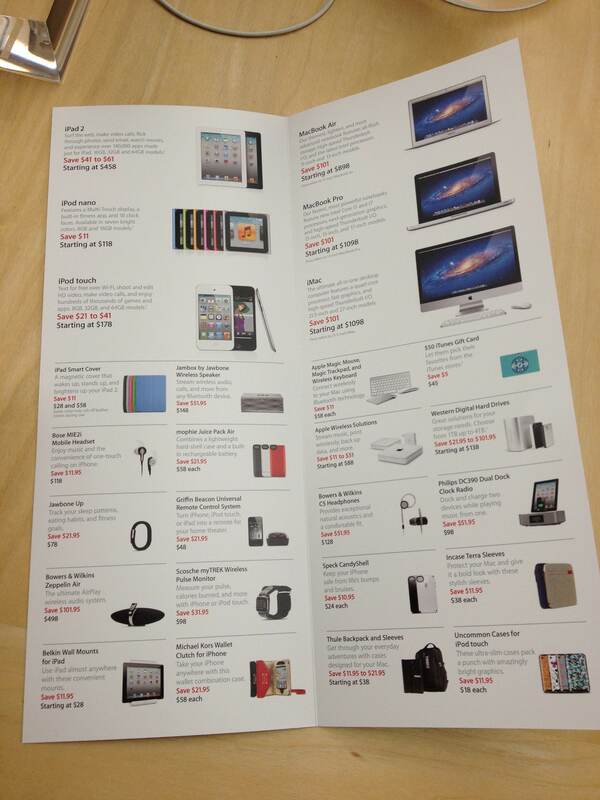 Hit up our Black Friday 2011 Price Guide to get the best deals on Apple hardware and accessories. It’s Black Friday and we’ve got the best deals from around the web on Apple products and accessories. Although most of the Apple Store prices (which we stumbled upon a few days ago) are moderate discounts, some are actually the lowest we could find, especially in iPads and accessories. We’re updating all day long so come back early and often…and don’t forget to check 9to5toys.com. s: Model Retail Apple BF MacMall Amazon BestBuy Misc. Both Australia and New Zealand Online Apple Stores just went down for Black Friday updates. Here’s a pretty good idea of what’s coming. We suspect the rest of the world will shortly follow – feel free to update in the comments (Oh, and Happy Thanksgiving for those in the US! ).